The idea that four archangels each represent a cardinal point is not a part of mainstream Christianity; there are no Bible verses as evidence. The association of the archangels with the four directions預s well as with the four elements of earth, air, fire, and water擁s a belief that comes from the Kabbalah, a religion that is thousands of years old and is the basis of Jewish mysticism. Do you know that the four Archangels represent a specific cardinal point: St. Raphael the East, St. Michael the South, St. Gabriel the west, and St. Uriel the North? I found out years ago that when I printed out their names on a piece of paper and cut them apart so I had one Angel for each wall of my bedroom that God’s Divine Protection got so much stronger and my bad dreams stopped immediately. I was so inspired by this that I printed out Arch Angel Names, in a set of all four on separate pieces of paper and cut them apart and scotch taped them onto each wall of my rooms throughout the house ON THE WALLS THAT MOST CLOSELY REPRESENT THE DIRECTIONS IN YOUR HOME OF EACH OF THE FOUR CARDINAL DIRECTIONS. Things really began to change in the most positive way possible after I INSTALLED ARCH ANGEL PROTECTION ON EVERY WALL IN THE HOUSE. These have Sacred Protection Energies whether they are visible or invisible to others. YOU & GOD KNOW THEY ARE THERE. THAT IS ALL THAT IS NECESSARY. They will activate, through your FAITH IN GOD, THAT HE WILL SEND THE ANGEL PROTECTION TO YOU. THE NAMES OF THE ARCHANGELS ARE USED WITH THEIR NAMES ON PIECES OF PAPER, TO SYMBOLICALLY BRING ARCHANGEL’S UNTO YOUR HOME. Here is the list of all you will need. Print them out, cut them apart and tape them on all four walls of each room in your home IF you desire angel protection to be present in your home. As you place them START WITH THE EAST AND ST. RAPHAEL AND ADD THE OTHERS. Place the East Arch Angel on the wall you feel is as close to the Easterly direction in your room as possible. Likewise, follow through with the Arch Angels in order of their direction. It is spoken of in the Holy Bible that when God comes back for us that He will come from the East. In honor of that, I am beginning with the East, and the other directions should be placed on your walls in the order below. Good Luck with your ARCH ANGEL PROTECTION BLESSING FOR YOUR HOME. GOD WILL BLESS YOUR EFFORTS WITH PROTECTION FOR YOUR FAMILY, PETS, PROPERTY AND ALL THAT IS CONTAINED UPON YOUR LAND. If your spirit needs uplifting and positive changes, or if you are seeking direction for your life, contact Alexandra – You’ll be glad you did! The Best Reading You Will Ever Have. Ever wonder why some people seemingly get all of the opportunities or the lucky breaks and others of us do not? Sometimes it’s a little dismaying, even causing us from time to time to wonder if we are living under a curse. Did we anger God as we know Him? Has He finally decided to get even? Am I reaping what I have sewn? Enough bad luck, unfortunate coincides, traffic tickets, loser bosses or co-workers wrecking havoc on our psyche, raging children or in-laws or outlaws and we begin to wonder just what it is we might be doing to bring all of this upon ourselves. Is it karmic? Was I a real jerk in a possible past life and now I have to learn whatever lessons it is that I may or may not recognize? What if I don’t want to learn it? What if I refuse? All of these very valid questions offer us points to ponder in a possible rational explanation that we could maybe be responsible and that would be the logical reason why we are suffering. Logic or not, do you want to keep suffering? Wouldn’t you like to see things in your life simply flow…and you not have to live on edge? There are things you can change, tangible and intangible, real and transcendental cures that will impact you and those in your environment more than you can ever imagine. The wisdom that I have collected over the last 23+ years through the inspiration of the Holy Spirit, His leadings and teachings has proven not only to me, but to my clients as well in their lives, that trusting your own personal Holy Spirit to guide your life is the foundation to the road to success. Once an individual gets in touch with the GOD PART of their psyche or spirit, purifies it, sets and maintains a high standard code of honor and seeks to live by it, balancing the peace and harmony within, blessing not only others, but themselves as well, life changes forever, and improves as we have never known it. Changes for the good, not the bad, begin to happen very quickly. A peace settles upon the soul that blesses from within. That peace when nurtured by an environment of spiritual accord and balance, will spread past our personal blessings into the others in our lives, as they stop by our home or office. You will notice their lives change as well. For those of you that fear I am deluding myself, let me appeal to your sense of logic and reason. If you don’t believe in gravity, does it care? No, it simply continues to affect your life whether you believe or not. Gravity will pull you, with or without your consent. It is a balance with the Earth’s energy that exists and we must accept. The same holds true of the energy that surrounds you. It has a pull, either negative or positive and it will influence you whether or not you believe it exists. Energy is charged by many forces, on a cosmic level, on an Earth plane, within the separate countries or states, down to the individual cities and townships where we live. Going further, the family energy that is either in balance or off, has a life of its’ own. The family’s energy is made up of the separate and individual personal energy of each member of that family, whether they are all living under the same roof or not. It would seem then that the individual and their state of mind, their peace and harmonic balance, would be the most important of all. If there is no balance, there is no harmony. If peace is absent, anxiety is often present followed by anger, spoken or unspoken boiling deeply within. If the individual’s energy spirit is the most important, it follows that perhaps we should be spending a little more time being good to that soul and nurturing it, inside as well as out. I’m not talking hot fudge or other occasional binges we may participate in attached to life’s little celebrations. Where you rest that soul at night, how you feed it with toxic or non-toxic information, the sacred space you live in and the energies present all dramatically impact the soul condition. Bringing that soul up to its’ higher self and seeing life turn around to be meaningful and prosperous would be the ultimate success. Seeing your loved ones blessed by your initial efforts could have a completely different impact upon them than the message you are sending out to them now. These are the things I seek to help demystify so you may find your life much more productive, balanced and successful. You are the only one that can take charge and make these changes. You have to want to. All of the good advice from all of the well wishers in the world plus $.50 will buy you a phone call in the domestic U.S. The phone call you know you can trust, unless of course the telephone happens to malfunction and keep your money and deny you the service. But the tried and true, some proven or unproved wisdom from friends or loved ones may not be what we want to hear. Change must start from within the individual and manifest from that new energy, outward. It goes out to the home, the work, the friends, the associates and the neighbors. Our neighbors even include people that surround us in traffic. If we have anger and aggression it can really show up in a traffic jam. The true soul reveals itself in the most intense of times. Showing our true colors, generating the energy from within sometimes sends a communication we wish later that we had not revealed. It may not be an image we can be proud of or wish our children to imitate. If we take charge, changing the inside to comfort our soul, balancing the harmony in our sacred space and thus allow peace to rule, it sends a message to the universe, to God as we know him and to every other creature we may come in contact with in our daily travels. That message has an energy of its’ own that radiates or projects positive vibes or feelings outward, blessing as it flows. As the balance is achieved, positive vibrations sending out the right message, the way you were meant to live attracts the positive charges from the universe, the blessings as they were meant to be, to you, your life and those surrounding you. As the blessings start to flow from the Creator in charge of this universe, you will feel as though you are greatly tuned into your spirit. There is an almost unbelievable peace that takes control of your life and destiny. This in fact is the main secret that so many overlook. Soul survival is what we are accustomed to. “The peace that passeth all understanding,” (Philippians 4:7) spoken of in the scriptures is what we may obtain for ourselves and share among our loved ones. To entertain that peace within your soul is contagious. It will positively spread blessing loving energy to all that you meet. It is a choice. Everything is. As you define, sort out and purify your existence, the peace from within draws the success and motivation that you will need to find your destiny from the Creator as you know Him, or from the central creative force of the universe. It matters not what name you assign to God as you know Him, only that you use your knowledge and wisdom to discern for yourself how to live and worship in a manner that will be the most supremely beneficial for you to honor Him and yourself in the process as well. This is the essence of unraveling the mystery of your life. You are the only one that can do that for yourself. I can offer suggestions, but if you are not willing to try, past your present personal situations using your personal faith and belief system, then it will never happen. You may not agree with all of the things mentioned here. I know I certainly did not agree with any philosophy that was not what I was brought up to accept. I have been directed many times, through prayer, faith and using spiritual wisdom to test the spirit(s) of new things that took me past my learned prejudices against other philosophies. My Higher Power has taken me on a grand adventure to be whole and healed, and able to face anything that may confront me in the future. I never knew I could feel whole and healed. I thought that part came after, and only after I sacrificed my whole life to being one of those good little church folks that gave up everything. Hopefully God would take notice upon my death and take me to Heaven. Or if the Christian Rapture took place, I was hoping to go to the good place in the twinkling of an eye. The scriptures promise we will have a new body and a new life. That seemed like a very distant future with a bonus at the end to me. Never did it occur to me that I could introduce spiritual power into my life to manifest healing and wholeness within my body and spirit by using the supreme power of the Holy Spirit. Learning to live by your Holy Spirit will not only bless everything it touches, it will show you the way to truths that will work in your life and allow you to achieve a cushion of paradise all around your very existence on a daily basis. It is unlikely that God will give us the lotto no matter how much we might ask in prayer. He will however, give us spiritual wisdom as He pours out a new awareness upon our lives. What will come about in an almost unbelievable manner, is an intensity of the Holy Spirit flowing through our lives to the point of being so “in tune” that we may feel like we have hit the lotto in our own personal circumstances. Why not give it a try? If you are like most of us, you are willing to try just about anything to grasp even momentary peace or solitude. Use the parts of this publication that give you a good feeling. Discard the rest. Pray, meditate and feel the trust within your soul for your Holy Spirit. You are the keeper of your soul and only you get to make the decisions on its’ well being and balance. Only you can know, as your Creator leads you, what will be the best set of rules for you to live by. If you join with Him, a partnership is forged that is eternal. No one is able to take your power of discernment away from you. Only you can have this control over your own life. You are able to give away your choices of course, but that would be your choice. Open your mind and your wisdom to some new concepts. They will change your life, only for the best, forever. I invite you to look at your life as a grand adventure and explore your personal Holy Spirit as a daily, hands on blessing to you and those around you. Let God as you receive Him be the cruise director of your ship on the seas of life. You will be shocked what develops when you trust the instincts He placed there within you, to lead your life to the highest peaks possible for personal as well as professional success. The energies of having your Sacred Space in balance with Power Feng Shui will only help, bless, and uplift your personal spirit energies as they enhance the person you are becoming. May the Holy Spirit be with you. Bon voyage. There are things you can change, tangible and intangible, real and transcendental cures that will impact you and those in your environment more than you can ever imagine. The wisdom that I have collected over the last seven years through the inspiration of the Holy Spirit, His leadings and teachings has proven not only to me, but to my clients as well in their lives, that trusting your own personal Holy Spirit to guide your life is the foundation to the road to success. Once an individual gets in touch with the GOD PART of their psyche or spirit, purifies it, sets and maintains a high standard code of honor and seeks to live by it, balancing the peace and harmony within, blessing not only others, but themselves as well, life changes forever, and improves as we have never known it. Changes for the good, not the bad, begin to happen very quickly. A peace settles upon the soul that blesses from within. That peace when nurtured by an environment of spiritual accord and balance, will spread past our personal blessings into the others in our lives, as they stop by our home or office. You will notice their lives change as well. 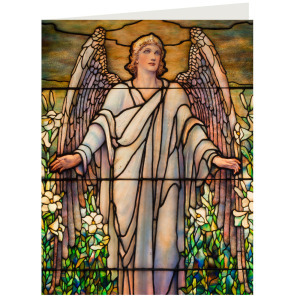 This beautiful stained glass panel’s quotation in Angel of the Resurrection from 1904, was made by Louis Comfort Tiffany’s Studios of New York City in stained glass and lead, 348” X 168”. It is on display in the Indianapolis Museum of Art as a gift of The First Meridian Heights Presbyterian Church, Indianapolis, Indiana. Any likeness of Angels that you display in your home’s Sacred Space with Power Feng Shui will bring an energy of Protection to the location. Collecting your Holy Things together in one location only makes the energy stronger for your home. Print out this Resurrection Angel Gabriel and place it in your own Sacred Space for your own positive energy protection. Displaying Holy Crosses above the front and back doors will also blast an energy of Protection. All cultures believe in and honor Angels, flying spiritual beings to bring us assistance, love, or blessings from our Higher Power, The Creator God. Angels are always a good gift to share with your loved ones. It makes them know that even when they are not able to be with you, they are wishing for Angels to be there as a source of protection and love from God. http://PowerFengShui.info for more amazing Tips of Power Feng Shui. May God Bless Each of You and Surround You Daily With Your Own Angels to Lead the Way in Your Personal Spiritual Journey.